A few weeks back, I presented a recipe that fell into the category of a “hurry up” meal: my white bean and summer vegetable pasta. The idea was to show you that eating vegan doesn’t mean you can’t whip up a nutritious and filling dinner in a pinch: it’s a myth that eating plant based food is twice as time consuming and difficult as eating an omnivorous diet (in fact, given the amount of time it takes to cook certain types of poultry and meat, I’d argue the exact opposite). Ah, the joys of summer learning, right? I’m doing my best to fit it all in (and by “it” I mean that I’m trying to make new friends, get to the gym, enjoy some time to myself, and look after CR as well as be a student), but my time for cooking has been limited at best. So my “hurry up vegan” series isn’t just for you: it’s for me, too. My second hurry up vegan recipe is even faster than my first, and it’s doubly efficient because it makes for terrific leftovers. It’s a simple quinoa salad, and it samples some of the best of summer tastes and produce in about six ingredients (not including the dressing). I threw it together the other night before dinner with a bunch of my fellow post-baccs, who had considerately warned me that they were planning on seafood, and I should probably bring a vegan option along with me, and it was ready in about 30 minutes with the help of my rice cooker (the active prep time itself took about 10 minutes). It’s fresh, delicious, and so tasty that a few of my friends requested the recipe. Rinse the quinoa through a fine sieve. Place it in a medium sized bowl with 2 cups water. Bring to a boil and reduce to a simmer. Simmer the quinoa for 15 minutes. Turn off the heat, fluff it with a fork, and let it sit for 30 minutes, or until room temperature. Add chopped vegetables, black beans, and herbs to the quinoa. Whisk dressing ingredients together. Add to the salad, toss, and serve. Leftovers will keep in an airtight container in the fridge for up to three days. 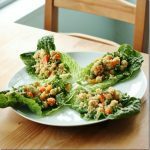 This salad is nutrient dense, a very complete protein (the quinoa itself is a complete protein, and the beans only compound its protein power), and a wonderful dish to enjoy either warm or cold. I had leftovers for a couple of days, and the salad seemed to get tastier as time went by. Added bonus? It’s awesome with a big scoop of guacamole on top. Speaking of being in a hurry, the science library is calling my name. Have a great start to the weekend! 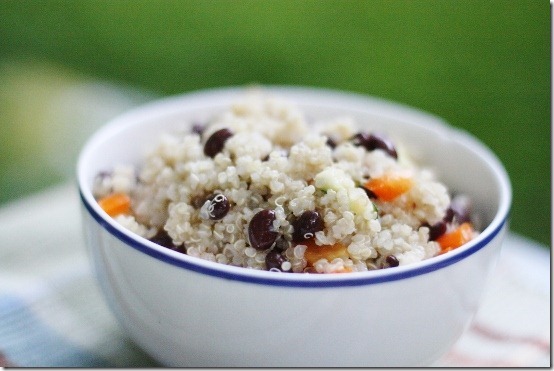 I love beans & quinoa together they always seem to fit perfectly, this salad looks delish and so simple! I love quinoa. Partly because it’s just so much fun, but also because it packs a great nutritional punch (with beans or all on it’s own). And guac goes with everything! Yummy!! I actually made a similar quinoa salad the other day, and I planned on posting it Monday! It’s a bit more Mexican-themed — fresh, raw corn, and some smoked chipotle powder. Yum! I love hurry up meals! There’s a small vegan cafe I love that serves a quinoa salad as a side dish, and it looks a lot like yours because it also black beans and peppers. Guac sounds like a great topping, but so does a scoop of hummus! Wow on the summer schedule, that’s crazy! Impressive, hang in there! 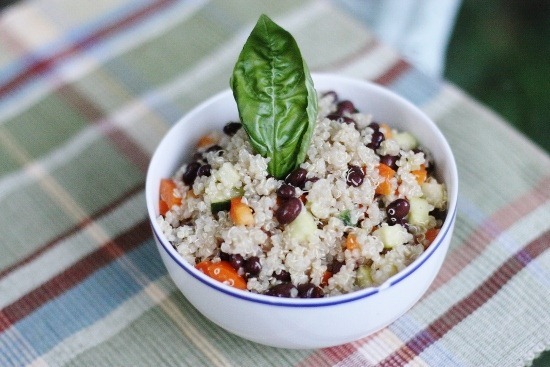 But this Black Bean and Quinoa Salad looks like the perfect summer busy dish providing go to leftovers, thanks! Sounds fantastic! I’m going to make this salad this weekend. I’ve been on a quinoa bowl streak myself this summer, mixing it up between the red and white variety, and adding either a legume or edamame plus some light veggies. I find it’s a combo that I can rely on to feel my best after lunch during this summer heat heartier/fattier fare feels too heavy. I’ll be trying your lovely looking creation next! 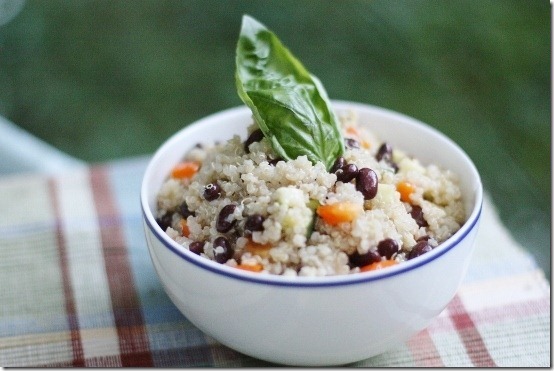 I have been researching quinoa recipes and came across this one… Looks very tasty. Cant wait to try it!! Looks great! Most anything rice is used in you can replace it with quinoa. Quinoa and black beans were meant to be together! Yum! I loved your last hurry up vegan post and I expect this to be just as delicious! I have my last container of Summer Veggie Pasta for lunch, so I’ll be whipping this up soon! My summer schedule has been crazy as well, so this looks like the perfect quick meal for me! I definitely will be trying it! Good luck with your summer classes! I’m a huge fan of this hurry up series. This sounds delicious–and what a tasty vinaigrette! My rice cooker is such a time and life saver! I look forward to seeing more quick, easy, rice cooker friendly recipes. Keep up the good work! My 11 year old mostly vegan daughter comes home from sleep away camp on Sunday. Yipee!!! Thank you Gena for reminding me that it’s time to ramp up some of the simpler vegan delights–any whole grain+bean+chopped veg+a little seasoning is a phenomenal recipe for vegan success in my house! That sounds so good! 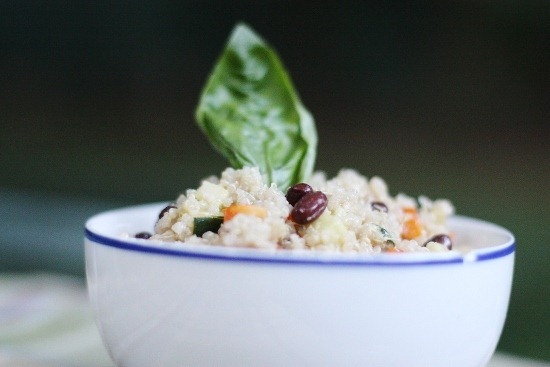 I’ve never actually had quinoa with beans, but it has been on my must-try list for awhile. Yum! This quinoa mexican salad dish looks amazing! I’m always looking for more vegan crowd pleasers, so this will come in super handy. Can’t wait to make it! Good luck with classes- i’m sure you’re doing great! It’s also a myth in the same family of myths that you can’t feed kids vegetables without doctoring them up to no end. And a myth that you can’t create a largely plant-based dietary path for a family without breaking the bank or spending tons of time doing so. Wrong! I know I spend far less money and time on what I feed my family than most women and I don’t sacrifice taste! I would love to try your quinoa salad. And so happy you’re finding things that are easy, great, and suit YOU perfectly. YESSSS! Quick is mah middle name! I was just searching for a way to use Quinoa in some great recipes. Thanks for this one, it sounds delicious. Thanks for this delicious recipe. Love discovering new recipes for Healthy Living. Yum! This looks lovely. I hope you have time to squeeze seeing me into your new and insanely busy schedule. I’m back this week! 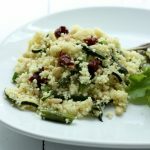 I’ve been making a lot of different quinoa recipes lately because my husband is trying to incorporate more whole foods to his diet, so I’ll have to try this one too. Funny story… he tried to make rice and beans the other day so he make the brown rice and then mixed a can of beans with it. Then he wondered why it was so bland! Needless to say, we both need recipes for something to come out tasty! 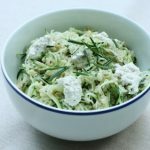 I like these quick and easy recipes since I don’t have much time either!! From your twitter feed it looks like you’re taking o-chem this summer? Good luck!!! I took physics during the summer and it was brutal but got the job over quickly. Lotsa flashcards helped me in ochem. And fortunately the o-chem on the MCAT is pretty easy. Lots of stuff related to the lab techniques but you don’t have to memorize a million rxns like in the class. I’ve been doing a lot of quinoa salads lately, too. And I’ve been adding massaged kale, too, which I’m sure you’d love! This sounds delicious! I look forward to trying it this week. Sounds delicious, but if you cook the quinoa, is it really considered raw? No, it’s cooked, not raw. I love quinoa! Thanks for sharing this recipe! 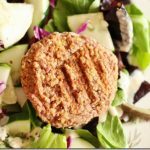 Another healthy and tasty recipe that I found on another blog is the tuna lettuce wrap, very easy: http://www.amandarussellworkouts.com/node/115 ! I don’t prefer it that way, but quinoa can be sprouted and eaten raw, yes. Yum, yum, yum. Just made this and it was delicious. Had two servings and felt good about it instead of guilty.